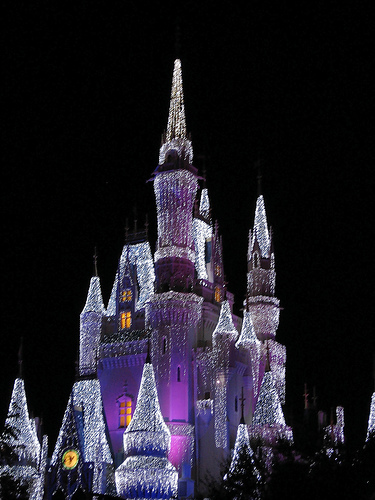 I looked at a million photographs of Christmas at the various Florida theme parks. These are the two that I thought really were magical and that could make me forget (for about five seconds) that these are commercial enterprises (for whom some of my friends and family work). Disney has little mystery for me now, but these beautiful and amazing photographs reminded me that at one time, it did. It's not just the sunburst---used here in a way that makes perfect sense--- and the purple streaks in the clear blue sky, but the wonderful rose tint of the central tower created by the sunburst effect. This is what you wish it would be like. Since the license didn't prohibit it, I crossed off the very bottom, where all the heads of the crowd could be seen (reminding you that it really is a theme park). I thought it better promoted the illusion. 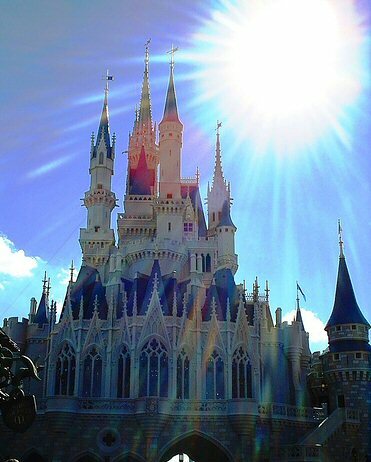 "Cinderella Castle, Magic Kingdom, Disney World," an amazing and magical submission by Daniel Jeffries | Daniel Jeffries' Homepage & Photography) | click here to see his other photographs | click here to see a larger version of this picture at Flickr. Hi there! The sunburst photo is mine, and I'd like to thank you for your glowing description of it. I had no idea it was on here until I did a search for my own name. The castle really is magical, isn't it?